With the Olympics nearly upon us, there's no better time than now to get your family into the spirit of the games! 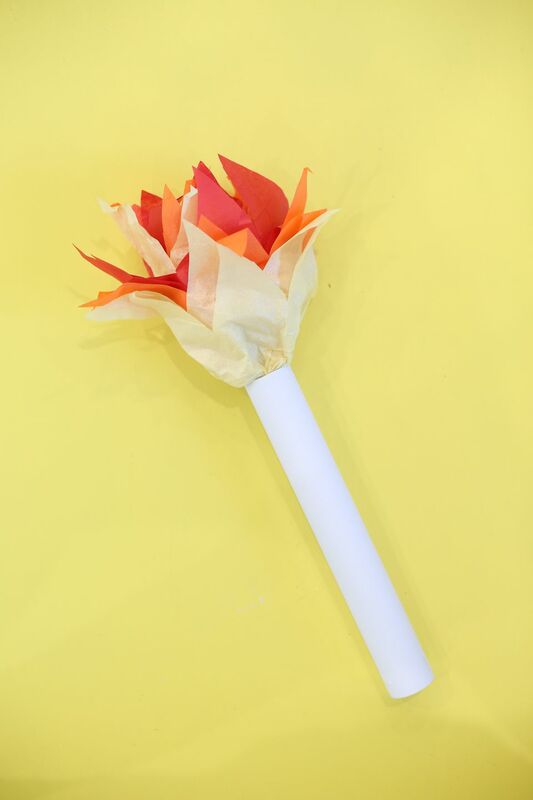 This Olympic torch project is the perfect opportunity to have a crafty date with your kiddos while you teach a bit about the history of the torch, the games and why we celebrate the incredible athletes who compete at the Olympics. It's a fast and simple project that you'll probably be able to put together using just the materials you have on hand at home. This is a project that you'll be able to modify according to what you have on hand. As an example, we used a cardboard tube that we had in our craft supply, but you can also use an empty paper towel roll or toilet paper roll. In a pinch, you could even cut up a cereal box and roll it into a tube! Be creative and have fun. Start by layering your tissue paper and cutting it into strips that are each about 8" tall and 20" wide. You'll need two strips of each color to make the flames look nice and full. Cut carefully so that the rectangles are roughly the same size. Using your scissors, cut flame shapes into one long side of the tissue paper. They should essentially look like a tall zigzag pattern cut into the top of the papers. Cut the flames so that they reach almost halfway down the 8" tall strip (about 3" to 4" deep). You can choose to cut the papers individually for a more randomized look or to stack the papers and cut them all together to save time (and cutting!). Neatly stack all of the tissue paper in a single stack, so that the sheets are slightly overlapping. Create the overlap at the bottom, so that you are able to see approximately 1/4" of each sheet sticking out from under the sheet on top of it. Use a few lengths of clear tape to affix the sheets of paper in this position. Start rolling the tissue paper in on itself, so that the color on the bottom of the stack becomes the outside of the roll. The roll should be loose and gentle so that you're able to see all of the colors as they roll together. Don't make it too tight or you won't be able to fluff the tissue paper without it tearing. Add a few glue dots around the base of the flame and insert it into the top of the tube, pressing the glue dots into the inner sides of the tube as you insert. You can also use school glue for this step, spreading a thin layer on the inside of the top edge of the tube and affixing the paper there. Be sure to leave ample drying time before moving on to the next steps. Use your hands to gently ruffle and fluff the tissue paper into a flame shape. Be careful not to rip as you separate the layers. Let your kiddos play with their torch as the game take place!